The Northwest's hardest working musician steps away from his rock band, the Gossamer Wings, to write and record a solo EP that once again finds him delving into folky-pop. 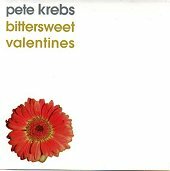 Six songs of tender, romantic sounds that are as lovely to hear as they are to sing along too, Pete Krebs proves that hard work, sweat, and a sheer love of his job will keep him writing some of the most poignant songs out there. "Fortune Valentines" is both romantic and sorrowful. With an album entitled BITTERSWEET VALENTINES, though, what would you expect? Pete's own experiences with love, romance, and finding the right girl shines through as the word bittersweet sums up everything nicely. His guitar sheds its skin as its tenderness leads the listener to Pete's relaxed, heartfelt voice that is also very delicate and romantic. Slipping pop into the hearty folk tune, Pete has you feeding off of it as if it were your bloodline. And, the line "I'm still the fool you left so long ago" echoes throughout, giving it an emotional climax that isn't soon forgotten. "Powder Keg" is another song tingling with bittersweet love; it even finds Pete proclaiming, "So, who do you love bittersweet?" Gentle and plenty emotional, Pete reaches deep inside his own self to give his listeners a glance at what makes him tick. Wearing his heart on his sleeve for emotional repair as well as to put forth the purity and honesty that has made Pete a favorite throughout the Northwest and beyond. The highest point on this album though is the jangly pop of "Told You So," a shining example of how Pete can be tender and folky and turn around the next and hit you with some of the best damn pop music that you've ever heard. Amazing AM radio pop, Pete reaches back in time to bring you a flavor of the past with a modern breath. If you're not up and dancing to this warm, infectious ditty than there is something wrong with you. Pete has worn so many hates over the years; he's been the frontman for a raging rock band (Thrillhammer), the focal point of the critically-acclaimed power-pop act (Hazel), and a man that has traveled through country, folk, and pop on his two solo full-lengths and two solo EP's. Here we find him once again delivering strong songwriting regardless of the type of song. He is truly a craftsman at writing songs without limitations. I'll give this an A.